Below is an overview of my printed work. These are mostly related to my work at UMass: Conference announcements, departmental posters or program flyers, for example. With all my digital work, it is always fun to create something that you can hold in your hands afterwards. 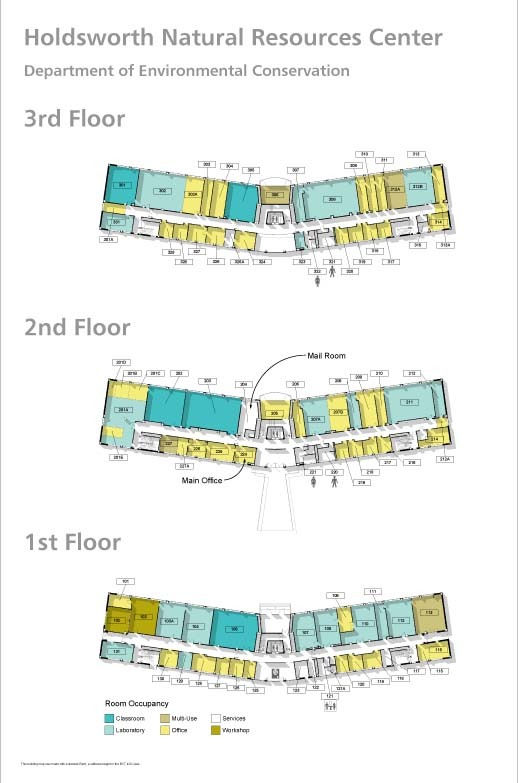 More information: With no room directory in our campus building and me teaching a Revit-based class, it just made sense to create a 3D model of Holdsworth Hall and use it to create a colorful 3D cutaway room directory that is now displayed in both of our lobbies. 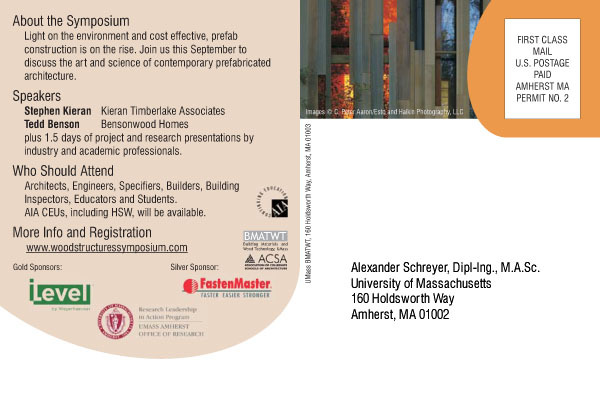 More information: These are promotional (and signage) posters for the hallways of Holdsworth Hall at UMass. One feature that I include more and more are QR codes, which allow for a convenient direct linkage between the printed item and online content. More information: This set of seven flyers promotes another one of the undergraduate programs in the Department of Environmental Conservation: Natural Resources Conservation. This major has six very distinct concentrations, which required six individual concentration flyers in addition to a main summary flyer. More information: With our prgram’s renaming from Building Materials and Wood Technology to Building and Construction Technology, we were in need of a consistent graphical identity. Main elements are a blueprint-like background, a hand-sketched BCT logo and a good-looking, clean font (Frutiger). As an additional gimmick, I produced wood disks with our logo that have found good use as coasters. 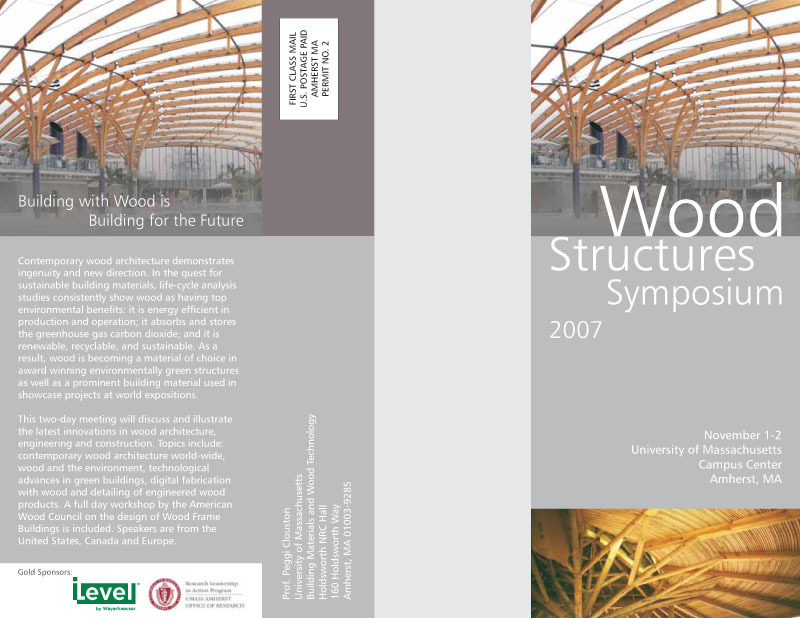 More information: This was the promotional flyer for our first Wood Structures Symposium, held at UMass. 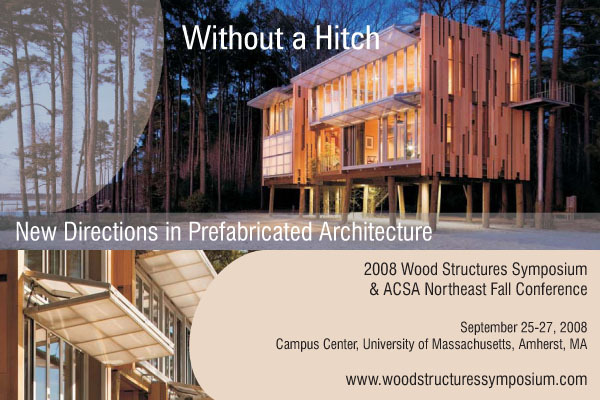 Beyond the usual organizational help, I produced the website and this flyer to announce the event. 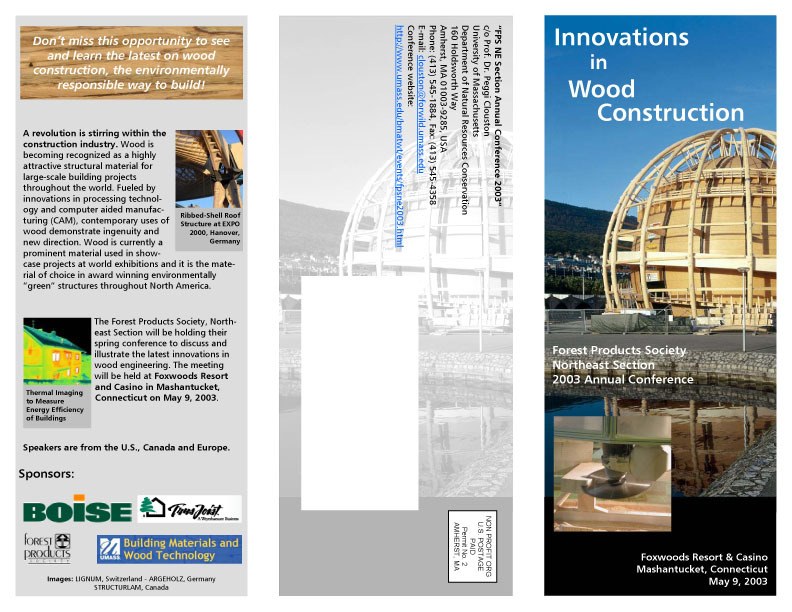 The flyer was meant to provide a forward-looking, inspiring presentation of what can be built in wood. The dynamic images and the clean presentation conveyed that well in my eyes. More information: In retrospect the design appears a bit “clunky” and compact. 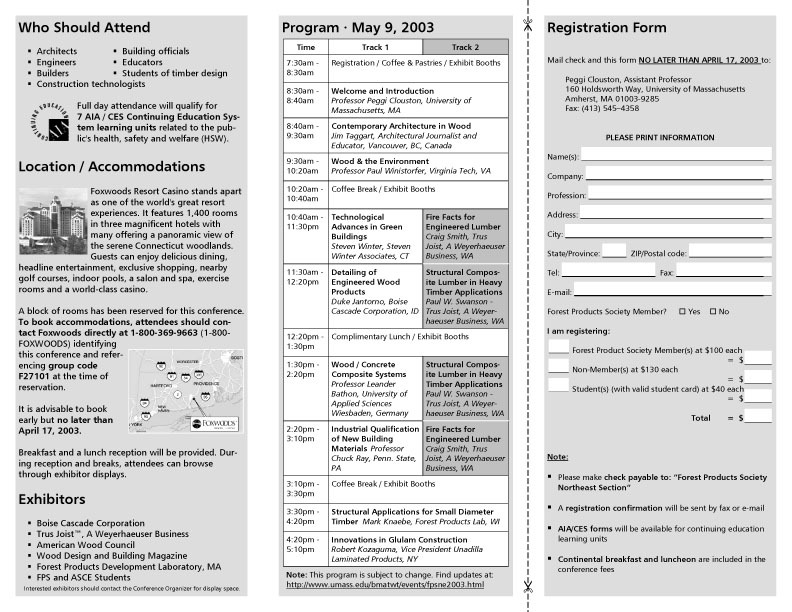 The reason for the white edges was that originally, we wanted to copy the flyers instead of printing them, which required that I respected paper margins. Ultimately, it got printed, though. 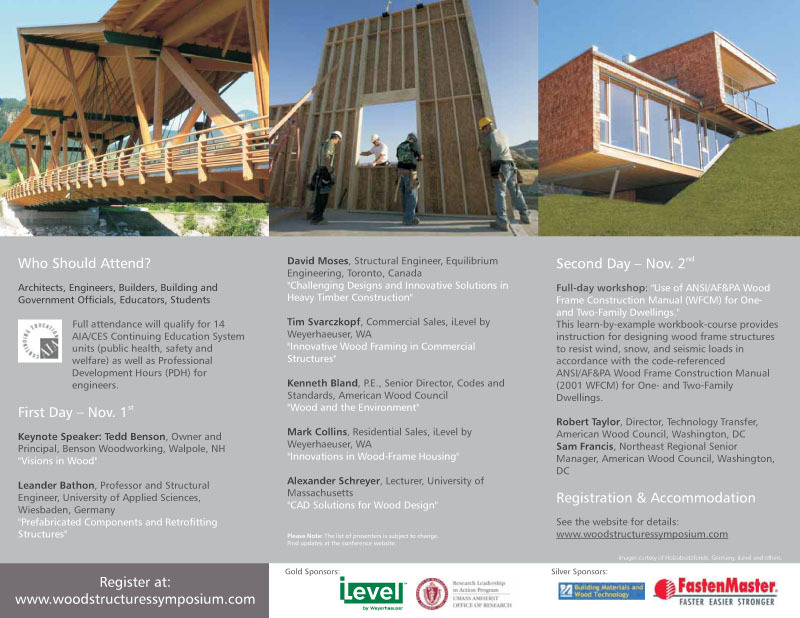 It was a fun conference – we held it at a casino!